Sweden and the UK have topped a table summarizing the countries which plan to exceed scientific advice in their 2019 fishing quotas, according to a report by New Economics Foundation (NEF). With just eleven months until the EU’s self-imposed deadline to end overfishing, the Our Fish campaign called on fisheries ministers to start delivering sustainable fisheries for all citizens, following the release of the report which claims member states will be fishing 312,000 metric tons above scientific advice for Northeast Atlantic fish stocks in 2019. Sweden tops this year’s overfishing league table with 52.4% of its Atlantic quota outside scientific advice, followed by the UK at 24.3% and Ireland at 21.7%. In terms of volumes, the UK is the worst culprit, with plans to take 106,925t more than is scientifically recommended (by which NEF goes “predominantly” by advice published by the International Council for the Exploration of the Sea). NEF produces the “Landing the Blame” report annually, following the setting of fishing limits for the Baltic and Atlantic, to analyze whether total allowable catches (TACs) have been set above scientific advice, and which EU member states benefit most from these TACs. Fishing limits for the North Sea and Atlantic are set during AGRIFISH Council meetings in December, and are not open to the public or live-streamed. “This lack of transparency makes it difficult to say who is most responsible for perpetuating overfishing, however the results clearly demonstrate who benefits most,” said NGO Our Fish. “Analysis shows that from 2001 to 2018, two-thirds of EU fishing limits have been continuously set above scientific advice. This willful overfishing, agreed upon by EU fisheries ministers, panders to the short-term profits of a few, to the detriment of the long-term health of the marine environment and all EU citizens who are the owners of this priceless public resource and depend on it for future security”, said Rebecca Hubbard, Our Fish program director. The report suggests Denmark has risen to fourth position in the league table of member states with the highest percentage of their TAC in excess of scientific advice. According to the report, for the 2019 Atlantic TACs, fisheries minister Eva Kjer Hansen was involved with TAC decisions that allow fishing at 19.7% above levels that scientists have determined to be consistent with the sustainable management of European fish stocks — almost four times higher than last year (5.6%). Germany has risen from sixth to fifth position, planning to allow fishing at 18% above recommended levels. Ireland has dropped from first place to third, however, the level of overfishing has actually increased to 21.7% of excess TAC (from 17.8%). Ireland has this year received 34,052t above scientific advice, compared to 31,127t last year. The Netherlands has dropped from fourth to sixth position, with TAC decisions that allow fishing at 13.5% above levels that scientists have determined to be consistent with the sustainable management of European fish stocks, however this is still an increase from 7.5% for 2018 TACs. The Netherlands is also fourth in terms of the total tonnage of TAC set above advice, receiving 31,910t excess TAC above scientific advice (an increase from 22,104t in 2018). 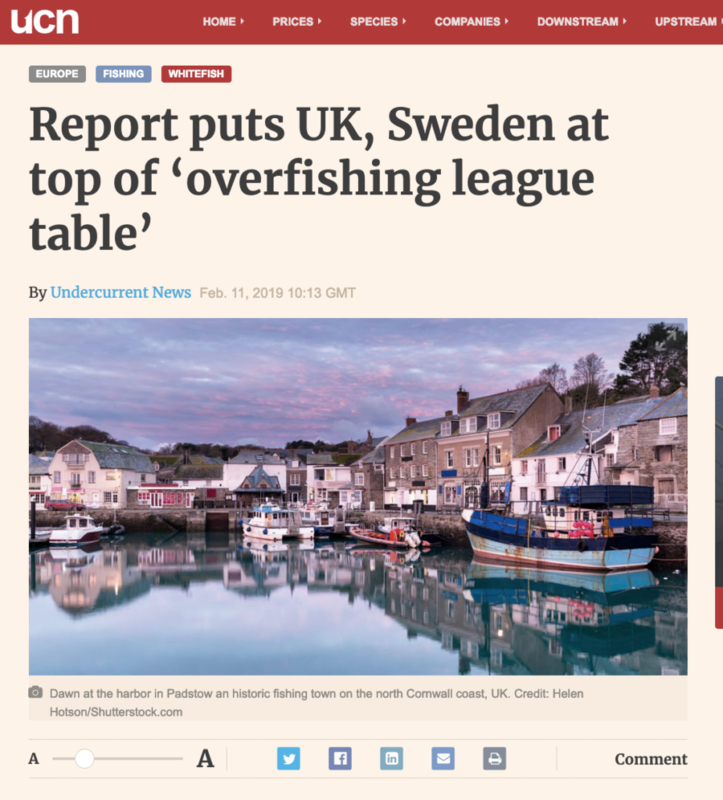 According to the report, Sweden has gone from ninth to first place in the “league table”, with over 52.4% of their TAC in excess of scientific advice, due mainly to herring, whiting, mackerel and blue ling in the Skagerrak and Kattegat. The UK maintained its position as the second worst overfishing nation in the EU, with the highest percentage of their TAC in excess of scientific advice for Atlantic fish stocks (24.3%), however it the equivalent volume in tonnes has increased by over 30,000t to 106,925t above scientific advice, according to NEF. “While Brexit makes all things fishy between the EU and the UK at the moment – one thing is clear — the UK is showing no signs of dropping its addiction to overfishing and continues to flout the interests of UK citizens who are the public owners of this precious resource. Whenever the UK stops working within the EU common fisheries policy, they must deliver a much stronger commitment to following sound scientific advice for sustainable fisheries management, or we will continue to see disastrous economic, social and environmental effects of overfishing,” said Hubbard.